Aloia, J. F., Cohn, S. H., Baub, T., Abesamis, C., Kalici, N. & Ellis, K. (1978 a). Metabolism 27, 1793–1796. Aloia, J. F., Cohn, S. H., Ostuni, J. A., Crane, R. & Ellis, K. (1978 b). Annals of Internal Medicine 89, 356–358. Anand, C. R. & Linkswiler, H. M. (1974). Journal of Nutrition 104, 695–700. Cohn, S. H., Vartsky, D., Yasumura, S., Sawitsky, A., Zanzi, I., Vaswani, A. & Ellis, K. J. (1980). American Journal of Physiology 239, E529–E530. Elahi, V. K., Elahi, D., Andres, R., Tobin, J. D., Butler, J. D. & Norris, A. H. (1983). Journal of Gerontology 38, 162–180. Exton-Smith, A. N. (1977). Proceedings of the Royal Society of Medicine 70, 615–621. Forbes, G. B. (1976). Human Biology 48, 161–173. Gallagher, J. C. (1976). Cited by Heaney, et al. (1982). Garn, S. M. (1978). In Nutrition and the Aged, pp. 73–90 [Farmer, F. A. editor]. Alberta: University of Calgary Press. Harlan, W. R., Oberman, A., Mitchell, R. E. & Graybiel, A. (1973). Hypertension, Mechanisms and Management, pp. 85–91 [Onesti, G., Kim, K. E. and Moyer, J. H., editors]. New York: Grume and Stratton. Havlik, R. J., Hubert, H. B., Fabsitz, R. R. & Feinlieb, M. (1983). Annals of Internal Medicine 98, 855–859. Heaney, R. P., Gallagher, J. C., Johnston, C. C., Near, R., Parfitt, A. M. & Wheedon, G. D. (1982). American Journal of Clinical Nutrition 36, 987–1013. Heaney, R. P. & Recker, R. R. (1982). Journal of Laboratory and Clinical Medicine 99, 46–55. Heaney, R. P., Recker, R. R. & Saville, P. D. (1978). Journal of Laboratory and Clinical Medicine 92, 953–963. Horsman, A., Gallagher, J. C., Simpson, M. & Nordin, B. E. C. (1977). British Medical Journal ii 789–792. Horsman, A., Jones, M., Francis, R. & Nordin, C. (1983). New England Journal of Medicine 309, 1405–1407. Iacono, J. M., Judd, J. T., Marshall, M. W., Canary, J. J., Dougherty, R. M., Mackin, J. F. & Weinland, B. T. (1981). Progress in Lipid Research 20, 349–364. Kannel, W. B. (1977). In Hypertension, Physiopathology and Treatment, pp. 888–910 [Genest, J. Koiw, J. and Kuchel, E. editors]. New York: McGraw-Hill. Kannel, W. B. & Gordon, T. (1977). In Obesity in America, pp. 125–163 [Bray, G. A. editor]. NIH Publication no 79–359. Bethesda, MD: National Institutes of Health. Katz, S., Branch, L. G., Branson, M. H., Papsidero, J. A., Beck, J. C. & Greer, D. S. (1983). New England Journal of Medicine 309, 1218–1224. Kr⊘lner, B., Toft, B., Nielsen, S. P. & Tondevold, E. (1983). Clinical Science 64, 541–546. Langford, H. G. (1983). Annals of Internal Medicine 98, 770–772. McCarron, D. A. (1983). Annals of Internal Medicine 98, 800–805. McCarran, D. A., Stanton, J., Henry, H. & Morris, C. (1983). Annals of Internal Medicine 98, 715–719. McGandy, R. B., Barrows, C. H., Spanias, A., Meredith, A., Stone, J. L. & Norris, A. H. (1966). Journal of Gerontology 21, 518–587. Matkovic, V., Kostial, K., Simonovic, I., Buzina, R., Brodarec, A. & Nordin, B. E. C. (1979). American Journal of Clinical Nutrition 32, 540–549. Meyer, T. W., Anderson, S. & Brenner, B. M. (1983). Annals of Internal Medicine 98, 832–838. Munro, H. N. (1964). In Mammalian Protein Metabolism, vol. 2, pp. 3–39, [Munro, H. N. and Allison, J. B. editors]. New York: Academic Press. Munro, H. N. (1976). Fat Content and Composition of Animal Products, pp. 24–44. Washington DC: National Academy of Sciences. Munro, H. N. (1981). British Medical Bulletin 37, 83–88. Munro, H. N. (1983). In Nutritional Problems of the Elderly, pp. 61–74 [Somogyi, J. C. and Fidanza, F. editors]. Basel: S. Karger. Munro, H. N. & Young, V. R. (1978). American Journal of Clinical Nutrition 31, 1608–1614. Parfitt, A. M., Gallagher, J. C., Heaney, R. P., Johnston, C. C., Neer, R. & Wheedon, G. D. (1982). American Journal of Clinical Nutrition 36, 1014–1031. Puska, P., Iacono, J. M., Nissinen, A., Korhonen, H. J., Vertiainen, E., Pietinen, P., Doughterty, R., Leino, U., Mutanen, M., Moisio, S. & Huttunen, J. (1983). Lancet i, 1–5. Recker, R. R., Saville, P. D. & Heaney, R. P. (1977). Annals of Internal Medicine 87, 649–655. Riggs, B. L., Wahner, H. W., Seeman, E., Offord, K. P., Dunn, W. L., Mazess, R. B., Johnson, K. A. & Melton, L. J. (1982). Journal of Clinical Investigation 70, 716–723. Shock, N. (1970). Journal of the American Dietetic Association 56, 491–496. Smith, E. L. Reddan, W. & Smith, P. E. (1981). Medicine and Science in Sports and Exercise 13, 60–64. Spencer, H., Kramer, L., Osis, D. & Norris, C. (1978). American Journal of Clinical Nutrition 31, 2167–2180. Steen, G. B., Isaksson, B. & Svanberg, A. (1979). 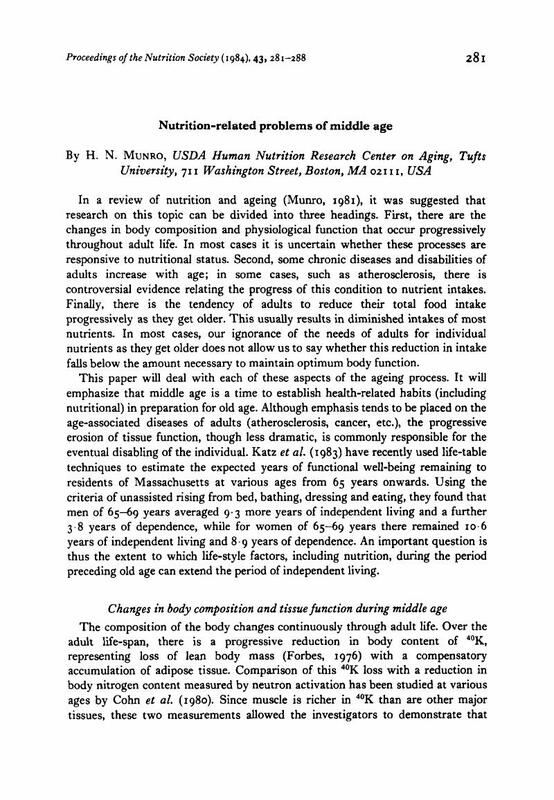 Journal of Clinical and Experimental Gerontology 1, 185–200. Tobian, L. (1983). Annals of Internal Medicine 98, 729–734. Van Itallie, T. B. (1978). American Journal of Clinical Nutrition 32, 2723–2733. Van Itallie, T. B. & Hirsch, J. (1978). American Journal of Clinical Nutrition 32, 2648–2653.